You love cheese as we do and you want to discover new ones without the pain of selecting the perfect one? 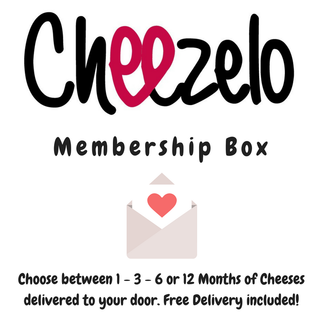 ​Trust Cheezelo and join our cheese lover club to get specials selected cheeses delivered to you every month. All our membership includes delivery in UK. Our cheeses are carefully selected on a monthly basis with the best cheese producers, Cheezelo takes care of the quality cheeses selected, carefully wrapped, includes gel pack in the box to keep its freshness during the transportation. We aim to mix different type of cheeses and our boxes usually includes hard cheeses, soft cheeses, blue cheese, soft ripped cheeses to please everyone. Our membership box is the perfect treat for your friends, family or just yourself.